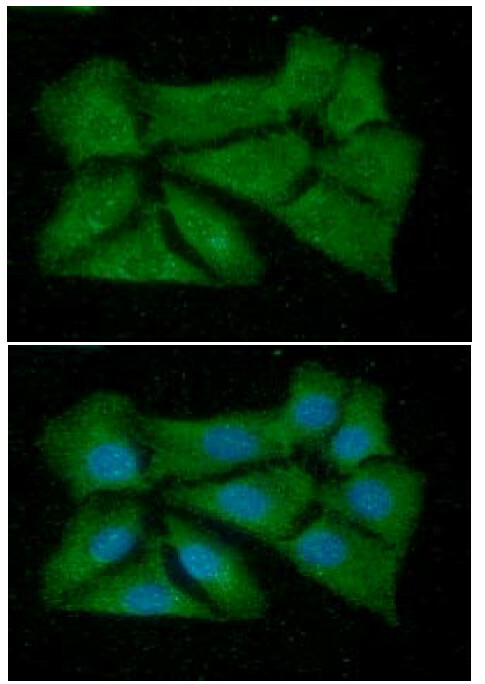 Mouse anti Human MIF 4E4. Product is tested for Immunocytochemistry/Immunofluorescence, Flow Cytometry, Enzyme Immunoassay, Western blot / Immunoblot, Paraffin Sections. 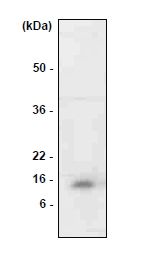 Recombinant Human MIF (1-114 aa) purified from E. coli. 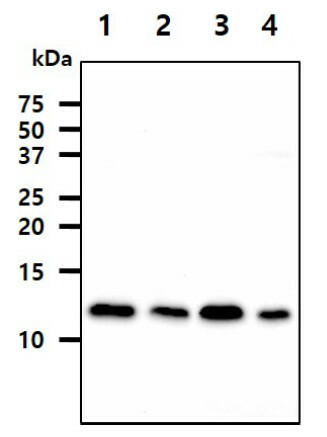 Western blot: 1/500-1/2,000. Recommended starting dilution is 1/1,000. 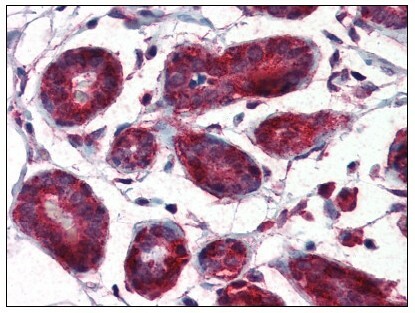 The cytokine Macrophage migration inhibitory factor (MIF) has been identified to be secreted by the pituitary gland and the monocyte/macrophage and to play an important role in endotoxic shock. 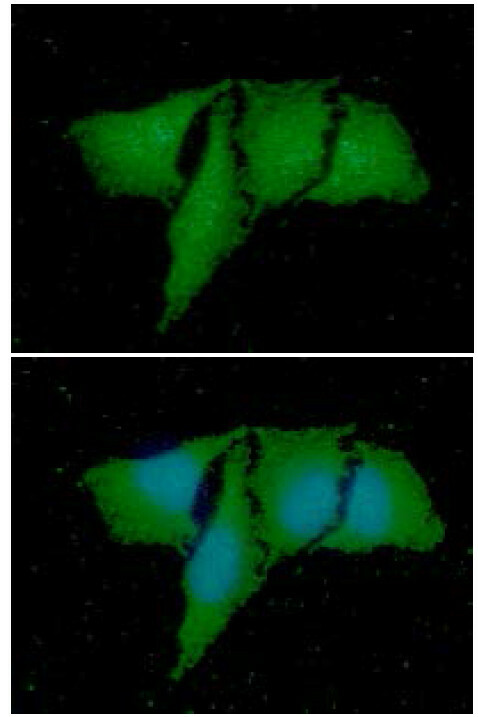 MIF has the unique property of being released from macrophages and T-cells in response to physiological concentrations of glucocorticoids. The secretion of MIF is tightly regulated and decreases at high, anti-inflammatory steroid concentration. Bernhagen J, Mitchell RA, Calandra T, Voelter W, Cerami A, Bucala R. Purification, bioactivity, and secondary structure analysis of mouse and human macrophage migration inhibitory factor (MIF). Biochemistry. 1994 Nov 29;33(47):14144-55. 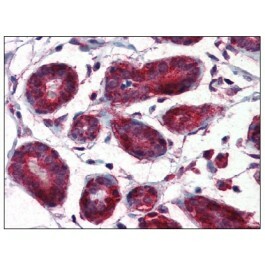 PubMed PMID: 7947826. Bucala R. MIF rediscovered: cytokine, pituitary hormone, and glucocorticoid-induced regulator of the immune response. FASEB J. 1996 Dec;10(14):1607-13. PubMed PMID: 9002552. Store undiluted at 2-8°C for up to two weeks or (in aliquots) at -20°C for longer. 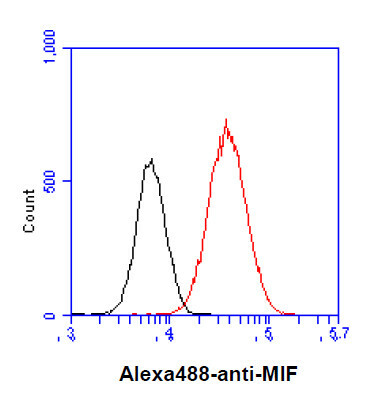 The antibody recognizes Human MIF.